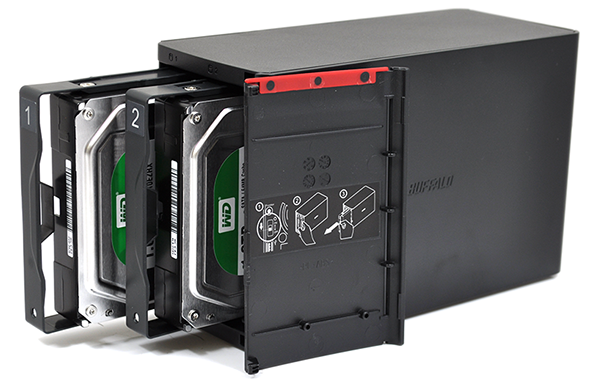 Network-attached storage can be a wonderful thing, but get carried away and costs can soon escalate. The latest all-singing, all-dancing units from some of the industry's big names carry frightful price tags, with diskless two-bay units approaching the £300 mark. That's a significant chunk of change and Buffalo reckons it can provide the goodness of consumer NAS functionality at a more attractive fee with the LinkStation 520. 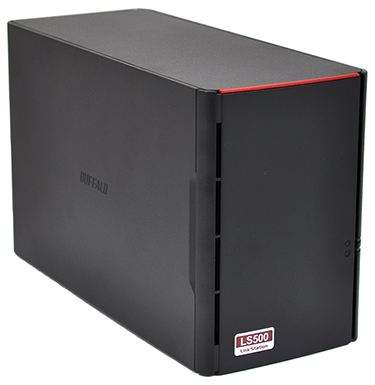 Priced from £155 and available in 2TB, 4TB, 6TB or 8GB configurations, the LS520 seems a good choice for newcomers to the NAS experience, so we have the entry-level 2TB model in for review today. First impressions are good. 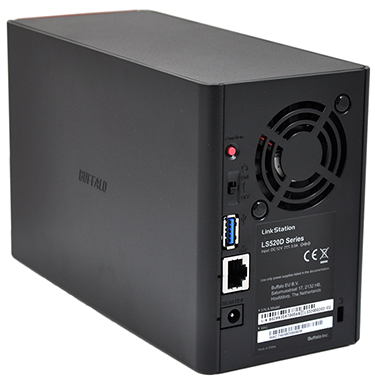 Conforming to our expectations of a home NAS, the dual-bay LS520 is barely bigger than a couple of hard disks and measures just 87mm x 126mm x 205mm in size. Finished in stylish matte black and easily compact enough to go unnoticed on a shelf, this is about an unobtrusive as NAS boxes get. The front of the unit has just two small LEDs - power and status - while all the connectivity options are kept around back. These include Gigabit Ethernet, USB 3.0 and a connector for the small power adapter. A single small fan is tasked with cooling the unit and does so without making too much noise, and the power switch is also positioned around back - this could be deemed awkward, but it may also prevent the kids from inadvertently turning the NAS off. Keeping the design simple but effective, Buffalo's front cover is a plastic door that feels like it should swing open but instead comes off completely, revealing the two pull-out drive bays. The plastic trays are numbered to avoid confusion and, in this particular model, each is outfitted with a 1TB WD Green hard disk. 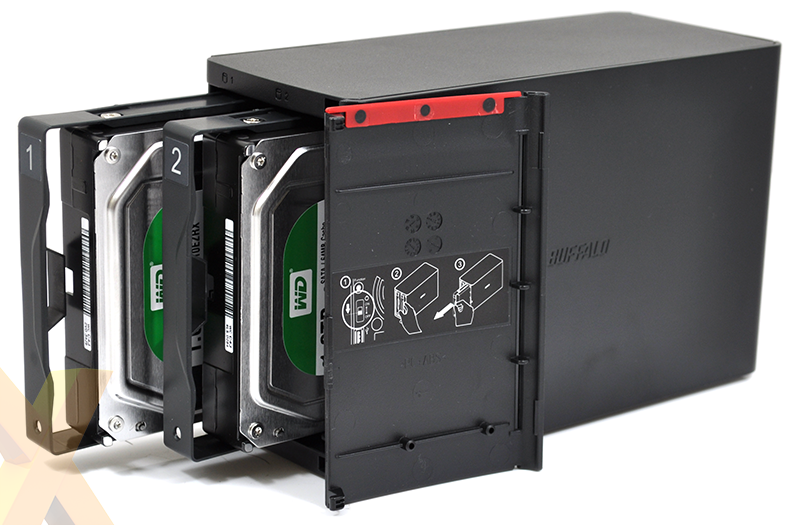 WD Green is an unexpected choice, as NAS-optimised Red hard disks tend to be the preferred choice by many, however this cost-cutting measure is unlikely to perturb the average home user. Both disks are pre-configured in RAID 1 for redundancy, leaving just under 1TB of space to play with, though RAID 0 is supported for anyone wishing to forego an automatic mirror in favour of speed and capacity. On the subject of speed, the LS520 features a dual-core Realtek CPU clocked in at 1.1GHz and 256MB of accompanying DDR3 memory. Buffalo reckons the combination is capable of sustaining data rates in excess of 100MB/s, though we wouldn't expect performance to be on par with pricier Intel-based units. It's a shame the LS520 doesn't provide a front-facing USB port or SD card reader for added convenience, but Buffalo's simple approach bodes well for unexperienced users and the no-frills design extends to the setup procedure. 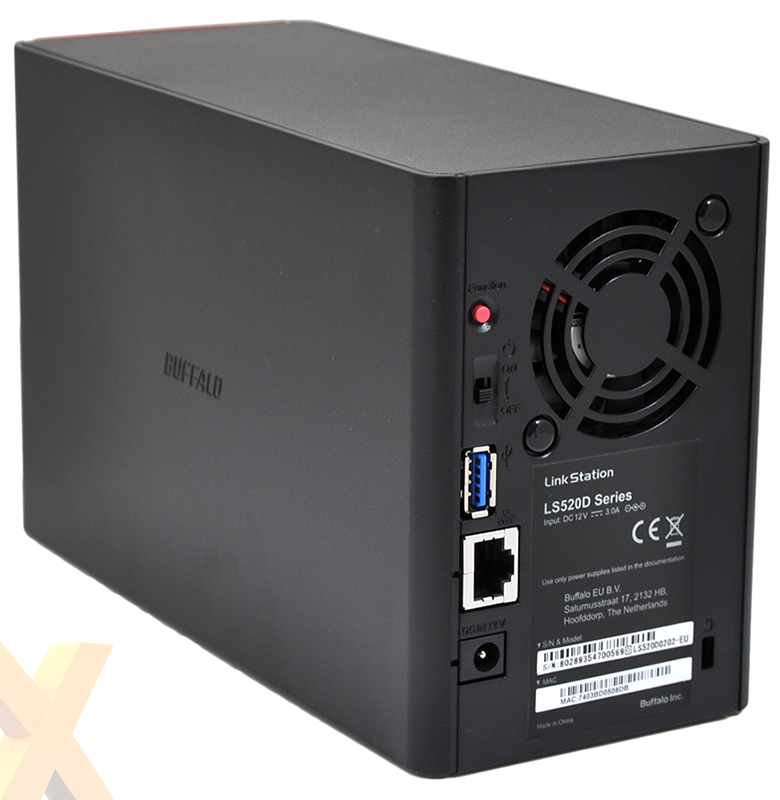 Configured via a web-based setup wizard, the LS520 gets up and running by asking the user to choose a new password and RAID mode. 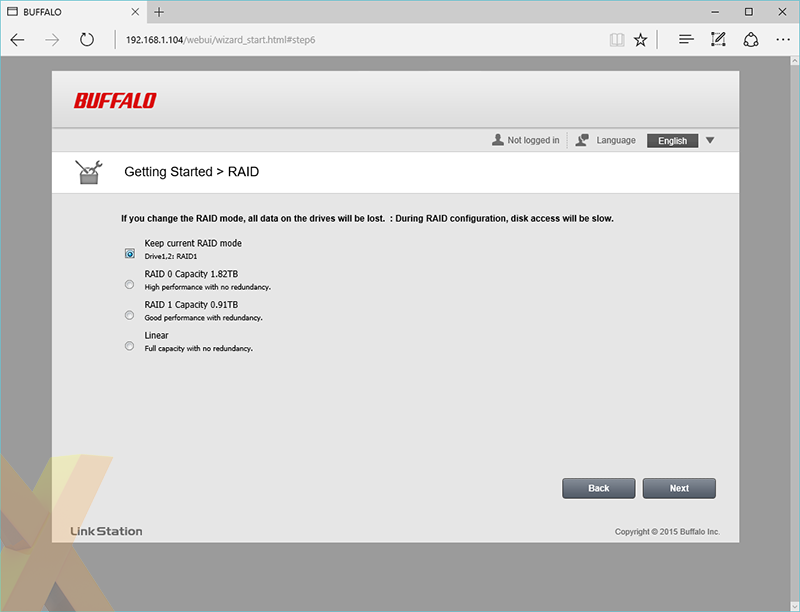 RAID 1 is already configured by default, meaning no waiting around for drives to synchronise, and the only other bit of user involvement is to choose the correct time zone. Setup couldn't be much simpler, and the clean presentation extends to the subsequent admin panel. 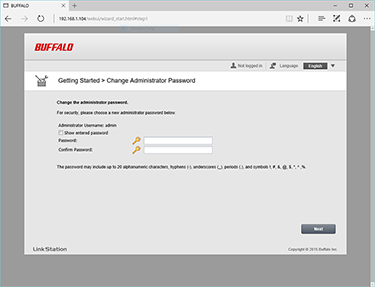 Instead of attempting to be all things to all users, Buffalo focuses specifically on features that are likely to matter to home users. 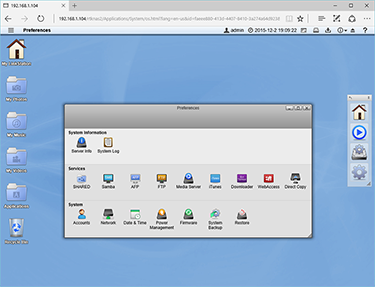 These include PC backups via five bundled licenses for NovaBACKUP, Mac backups via Time Machine, a built-in BitTorrent client for managing your downloads, and built-in DLNA and iTunes media servers. Everything a NAS newcomer needs, and we're pleased to see all of the above made available via a refreshed user interface that's more in keeping with the times. 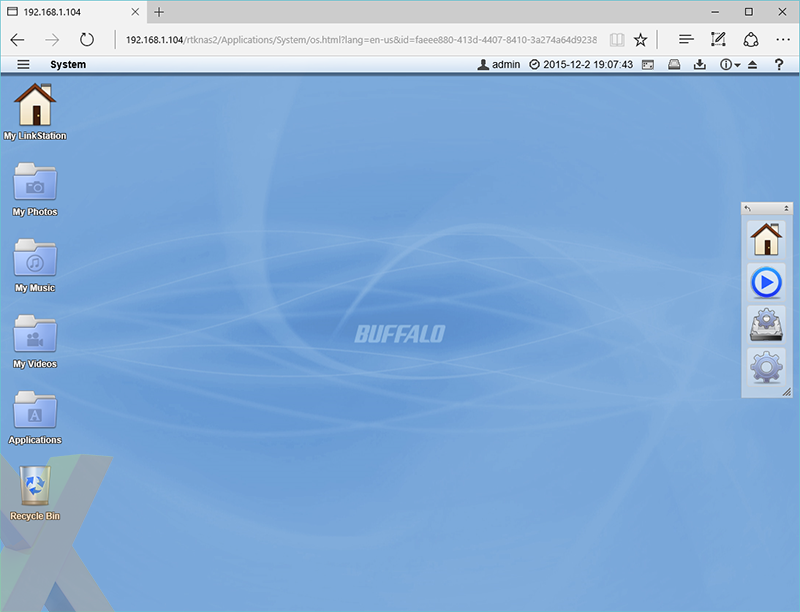 Buffalo's redesigned software now looks similar to what's on offer from the likes of Qnap and Synology, and the modern aesthetic is a welcome change. The core features are easily accessible and there are a few useful additions such as the ability to host an FTP server and an option to turn the NAS on and off based on a user-defined schedule. So far so good, however users should be aware of the LS520's limitations. Though the software is designed to look more advanced, the available feature set is minimalist in comparison to premium alternatives. The Buffalo unit won't serve as the centre of your home surveillance system, it won't alert you via email when a drive fails, it won't play nice with your company's Windows Active Directory, and there's no app store to open up a wealth of other opportunities. These are extras the target audience is unlikely to miss, but we would like to see Buffalo add a few more essentials - particularly the ability to shut down the NAS through software. Unless we've missed something obvious, the only way to trigger the shut down procedure is to flick the switch on the back of the box.